A Nottinghamshire/Sheffield hybrid, Roger The Mascot are four friends with energy in abundance. 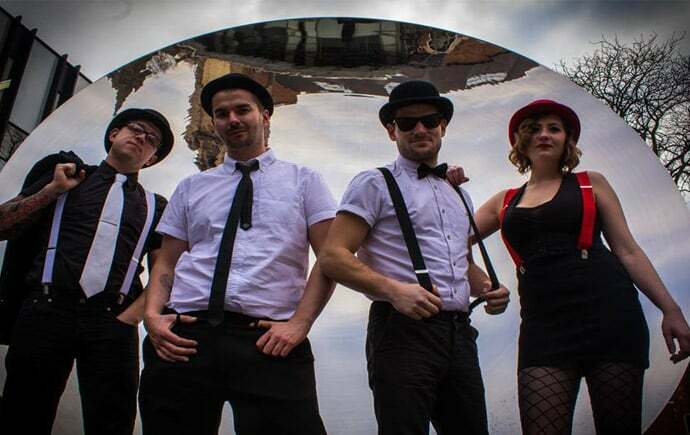 Their distinct brand of Indie Funk has been winning them friends (as well as competitions) since 2012 – with 2013 seeing the release of their debut album Wired To The System. Pitching up at Plug for an exclusive Exposed sesh, we dug out our finest bowler hat and met up with them for a natter. Laura: It’s very energetic, isn’t it? Jamie: You knew my cousin, Keeley. She told me you were looking to start a new band, so that’s pretty much how that came about. We all swapped numbers, met up in Nottingham one day and had a jam – it just gelled straight away. Laura, you’re the latest addition? Laura: I am, yeah, I wasn’t actually meant to be in the band. I knew Vardy from a while ago, but kinda met Kingy out and about one night. It was an acoustic night and I mentioned that I played sax I was asked if I’d put some baritone down on one of their tracks – but I ended up staying for the whole rehearsal. Then Kingy poked me for months to get my alto out of the loft to see if we could work with that on other tracks and I fell back in love with it. It just works so well and offers something different to a lead guitar. Let’s talk about image. Was your look an organic thing or did you just decide to do something different? 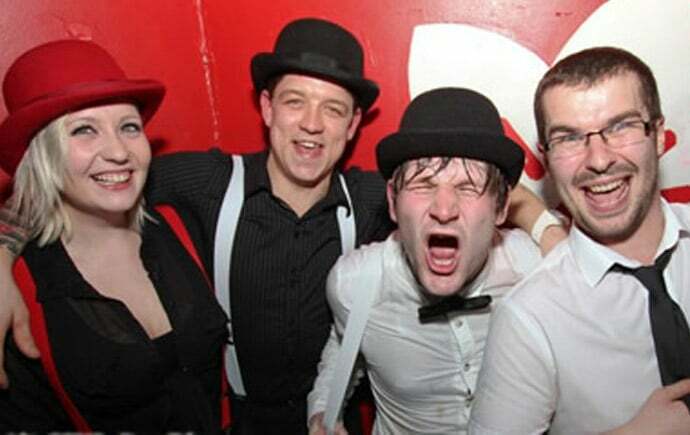 Matt: It was a Halloween show that we did – dressed up as A Clockwork Orange. It evolved from there. Laura: And then I joined and went ‘well, I’ve not got anything in black and white, but I’ve got some red braces and a red bowling hat. Vardy: Yeah, we were all on at the same festival. The InMusic festival in Croatia. Vardy: It was just awesome being on the same stage as someone as big as Arctic Monkeys. It was overwhelming, really. Matt: Once we came off, we realised that’s where we thought we should be. Vardy: Where we need to be. And would you say that’s been a personal highlight for all of you? Matt: We won a competition, EUFest, initially. That was a big highlight for us. Winning that, then being sent to Croatia to play on that stage, was just something else really. Jamie: We didn’t think we’d win. We knew we’d played well – but the bands we were up against were just brilliant. When they announced our name I felt like I’d taken an uppercut. And my legs went like fag ash. I’ll probably never experience anything like that again. Vardy: Yeah, we released it in February last year – a 10-track LP called Wired To The System. Laura: It’s quite different to the sound that we’ve got now. We’ve definitely evolved. Let’s talk about forthcoming releases then guys. What’s on the horizon? Matthew: Please Don’t Go is one of the tracks we’re doing today. It’s on the album but we’ve been reworking it. Laura: Yeah, we’re going to be re-recording it so I can put down a sax part to it and release it as a new single. Vardy: Then we’re doing a video shoot for it in a launderette. The chorus of the song goes: ‘Who’s gonna wash and iron my clothes’. It should be done for the end of March if everything goes to plan – but we’re not gonna rush it. And, in the longer term, a second album perhaps?